HOLIDAYS – Holidays under Negotiable instruments Act, 1881- Declaration of Holiday on the Occasion of SRI RAMA NAVAMI on 26.03.2018 (Monday) instead of 25.03.2018 (Sunday) – Notified. 1) G.O.Rt.No.2438, G.A. (Poll.B) Department, dated:31.10.2017. 2) From Commissioner, Endowments Department, Gollapudi, Vijayawada. 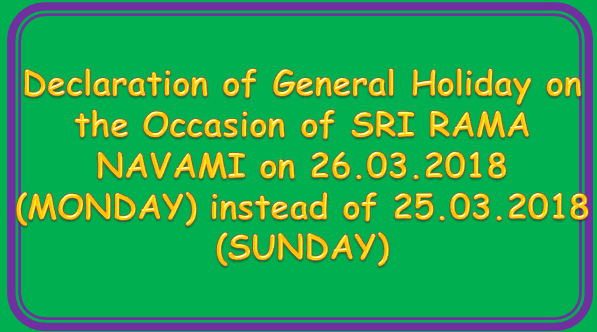 HOLIDAYS – Declaration of General Holiday on the Occasion of SRI RAMA NAVAMI on 26.03.2018 (MONDAY) instead of 25.03.2018 (SUNDAY) – Notified. 1) G.O.Rt.No.2437, G.A. (Poll.B) Department, dated:31.10.2017. 2) From Commissioner, Endowments Department, Gollapudi, Vijayawada. Lr No. DP1/Sriramanavami/2018, Dt.21-03-2018. In the G.O. read above, Government have issued orders declaring 25.03.2018 (SUNDAY) as Holiday on the occasion of SRI RAMA NAVAMI. Occasion of SRI RAMA NAVAMI. In partial modification of the orders issued in G.O.Rt.No.2437, General Administration (Poll.B) Department, dt:31.10.2017, notifying the General Holidays and Optional Holidays, the Government hereby declare 26.03.2018 (MONDAY) as General Holiday on the occasion of SRI RAMA NAVAMI instead of 25.03.2018 (SUNDAY). Click Here to Get G.O.RT.No. 679, Dated: 23-03-2018. Click Here to Get G.O.RT.No. 680, Dated: 23-03-2018.